The Trump administration has softened a key NAFTA demand for more North American content in car manufacturing — a potential olive branch on arguably the biggest sticking point as the U.S. pushes to reach a stopgap deal this month, according to three people familiar with the talks. The U.S. proposal would distinguish between different NAFTA car parts by grouping them into five categories, some of which would have a lower requirement for North American content or none at all, said the people, who spoke on condition of anonymity because they’re not authorized to discuss the negotiations publicly. While the U.S. had been pushing for 85 per cent of a vehicle’s content to be sourced from the three NAFTA countries to be traded tariff-free, its latest proposal would apply that threshold to major components such as transmissions and engines but not to the simplest inputs like nuts and bolts, the people said. Although it’s less arduous than the original demand, automakers would still be hard-pressed to hit the 85 per cent threshold on critical parts, and no agreement has been reached. NAFTA currently requires a typical vehicle to have 62.5 per cent North American content in order to benefit from tariff exemptions. The new U.S. proposal comes as President Donald Trump — facing a mounting tariff spat with China — takes a sunnier approach to NAFTA talks and pushes to announce a deal in principle next week. The Mexican peso and Canadian dollar both appreciated as the news boosted expectations for a Nafta agreement. The peso gained 0.7 per cent to 18.0993 per U.S. dollar on Wednesday and touched the strongest level since September. The loonie was 0.3 per cent higher at $1.2770. Shares of General Motors Co. jumped on the news, closing at US$38.03, up 3 per cent. The three nations, however, remain far apart on several issues and time is running out quickly, or may already have, to pass a deal before Mexican and U.S. elections. U.S. Trade Representative Robert Lighthizer’s office declined to immediately comment, as did the press office for Mexican Economy Minister Ildefonso Guajardo and a spokesman for Canadian Foreign Minister Chrystia Freeland. One problem with the new plan is that no cars currently made in North America would meet the proposed requirement for 85 per cent of major components to come from the region, according to one of the people. Some automakers would have particular trouble meeting the threshold because they typically build major components overseas and assemble them in North America, the person said. Talks over autos have shifted to whether higher wages, research and development could be included in the calculation of a vehicle’s value, to encourage more of that work to be done in higher-wage economies like the U.S. and Canada. Flavio Volpe, who represents Canadian auto parts manufacturers, said any sort of tiered system would potentially work but that details would be essential. The initial U.S. auto proposal was “a distinctly minority approach” that did not have broad support among auto manufacturers and parts makers, said Robert Holleyman, a partner at Crowell & Moring who served as deputy U.S. Trade Representative under Barack Obama. Auto industry feedback has probably influenced the U.S. position, he said. 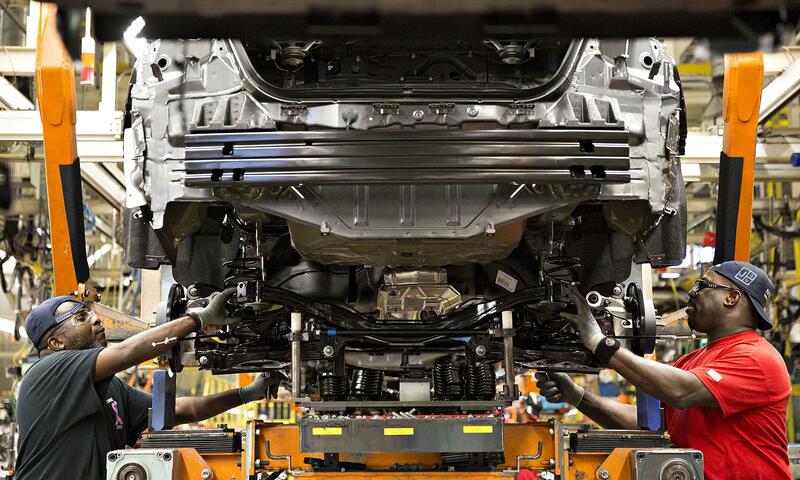 The notion of an 85 per cent content requirement for all parts has been “driving everybody nuts in the industry,” said Jerry Dias, the president of Unifor, a Canadian labor union representing auto workers and other sectors. He said that higher Mexican labor standards are the key to stopping the flow of manufacturing jobs from the U.S. and Canada, and said he’s worried that overly creative math that gives credit for research and development won’t actually bring back auto jobs to the U.S. and Canada. The Trump administration is pushing for a preliminary NAFTA deal to announce at a summit in Peru next week, according to three people familiar with the talks, and is hosting cabinet ministers in Washington this week to try to achieve a breakthrough. The three nations face a challenge to meet the U.S.’s goal because major divisions have persisted, including on automobiles. Getting a comprehensive agreement by next week looks like “a real longshot,” Carlos Gutierrez, U.S. commerce secretary under former President George W. Bush and co-chair of global business strategy firm Albright Stonebridge Group, said in an interview Tuesday. Dias downplayed the significance of any announcement made this month.